Next week from September 25 through October 1, the American Library Association (ALA) leads the annual “Banned Books Week: Celebrating the Freedom to Read” initiative. Along with a coalition of other organizations that include the American Booksellers Association (ABA) and National Council of Teachers of English (NCTE), ALA and the Freedom to Read Foundation (FTRF), ALA’s non-profit legal and educational organization, have added a focus on diversity for this year’s campaign. As the FTRF slogan reads, “free people read freely,” the U.S. Constitution and the First Amendment give us the freedom to access ideas and information. For school librarians, the questions and answers surrounding challenged and banned books revolve around how this right applies to students who access resources in our libraries and online. Since five of the top ten most frequently challenged books in 2015 were written expressly for children or teens, it is important for school librarians to have policies and procedures in place to address students’, parents’, classroom teachers’, or administrators’ concerns regarding the resources available through the library. “Banned Books Week” gives school librarians the opportunity to discuss ALA’s Freedom to Read Statement and the First Amendment with students, colleagues, administrators, and parents. It also serves as a reminder to examine our own collection development practices. In August, Maria Cahill published “How Do You Prepare for Challenges to Books and Other Resources” on the School Library Connection blog. She offers the results of an anonymous survey of 200 school librarians that found 65.67% of the librarians who followed collection development policies did not experience materials challenges; 22.89% did. Perhaps the most notable result of this survey was that 11.44% reported that they engage in self-censorship in order to avoid challenges to library materials. “Self-censorship is much more prevalent at the elementary level and in schools that have multiple grade configurations such as P-12, middle and high, etc. than at middle or high school levels” (Cahill). One reflection question for elementary school librarians could be: Are I Am Jazz and Nasreen’s Secret School: A True Story from Afghanistan in our collection? Why, or why not? A question for secondary librarians could be: Are Looking for Alaska, Beyond Magenta, and Two Boys Kissing in our library collection? Why or why not? What are you doing this week and next to highlight the right to read with your school library community? Please share in the comments section below. Note: One easy way for school librarians to participate in this campaign is to display the “I Read Banned Books” Twibbon on their Twitter and Facebook profile photos. Cahill, Maria. 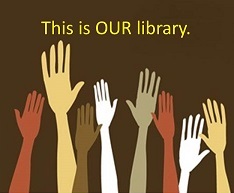 “How Do You Prepare for Challenges to Books and Other Resources.” School Library Connection Blog. http://goo.gl/NcrNf6. Accessed 18 Sept. 2016. Thurston, Baratunde. “I Am a Community Organizer.” Flickr.com. 18 Sept. 2016, https://www.flickr.com/photos/baratunde/2837373493. This entry was posted in Collection Development, Reading, Uncategorized and tagged collection development, resources, school library leadership by Judi Moreillon. Bookmark the permalink. Here is a slideshare about Banned Books that I created. Feel free to use it.